Venn (Fragments after a lecture on the history of photography, in two parts) is a projected 35mm slide installation which appropriates slide reproductions of photography from the modernist and contemporary canon that at one time formed part of two lectures given by the artist to undergraduate students. Deploying what can be called a ‘reprographic’ approach, the slides are optically duplicated, cropped, repositioned and cut-up, while the use of various blue and orange filters – employed in photographic lighting to convert the colour of a light to either daylight or tungsten light – correspond to, and at times confuse, the supposedly ‘objective’ (Neue Sachlichkeit) and the supposedly ‘expressive’ tendencies within the history of modernist photography as explicated in the original lectures. 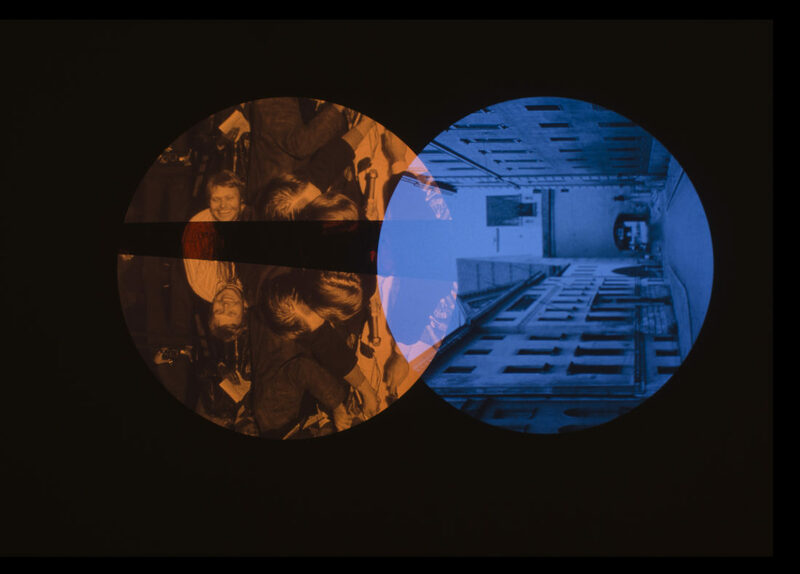 In the installation, sequences of projected circular images are juxtaposed and overlap to form a Venn diagram motif. While parodying the reductive binaries inherent in the original lectures, the work suggests other elective affinities and ways of looking while also offering the rich visual pleasures of projection and the diagrammatic.